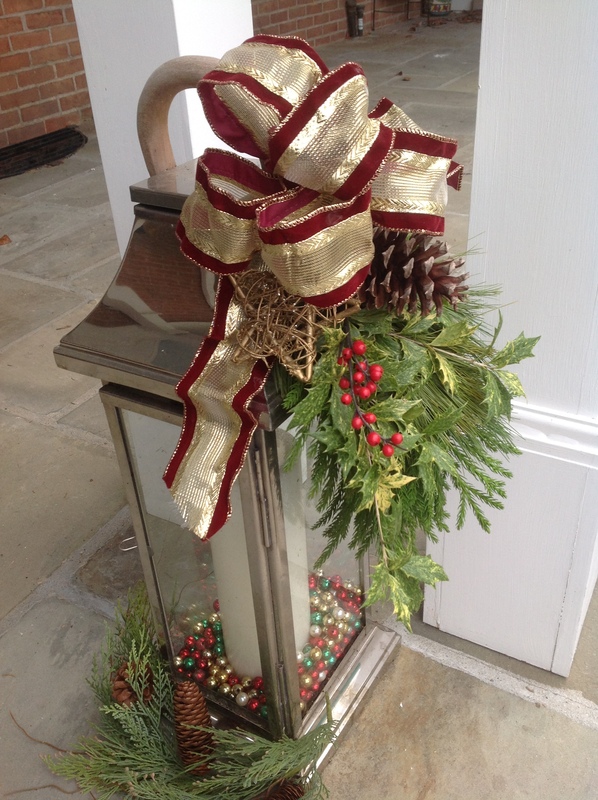 This year our front entrance is showing some swagger for the holidays. 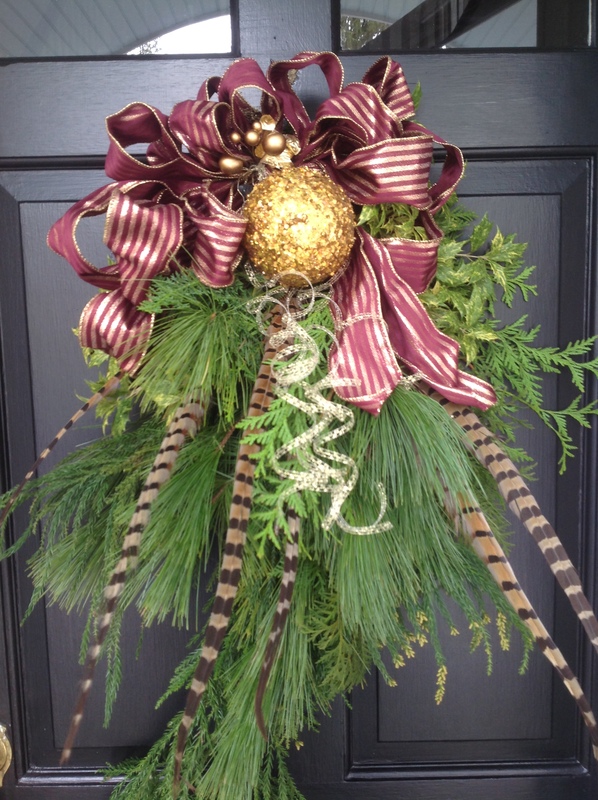 Instead of a wreath, I made a large swag with evergreens cut from around my garden then adorned it with ribbons, pine cones, pheasant feathers, ornaments in gold and burgundy and even some jingle bells. I love the scent of fresh greens to greet one and all at the holidays. Take a look at how it came together. To create a swag, I cut 4 to 5 varieties of evergreens to the desired length and width and bundled them with some florist wire from the top. I selected greens with different textures that offered subtle variations in color and dimension that could cascade down the door. I chose white pine, cryptomeria, gold varigated holly, fern leaf cypress and Leland cypress. I secured 5 pheasant feathers with the greens. Odd numbers always look best. On the back I used another length of wire to create a hook to hang the swag securely. I found it easiest to hang the greens at this point then work to adorn the swag while it was hanging in place. The greens are abundant and unfussy, left in their natural state and they fill almost all the width of our front door. Then came the fun part. First, I tied a big striped burgundy and gold French ribbon bow with smaller gold ribbon cascading down from it. I then looped wire around 3 pine cones and tied them onto some of the greens. I fastened a big gold glitter sphere ornament under the bow, off center, also with florist wire for some sparkle and bling and balanced that with smaller sprays of gold berries to the left. As I worked, I stepped back to look at the swag from a distance and assessed how much more I needed to add to it. Almost there, but not quite done. For a touch of whimsy, I nestled a small glittery bird ornament in the top folds of the bow. For a note of seasonal cheer, I looped 2 brass jingle bells to complete this Christmas swag. The rest of our front porch is decked out in complimentary colors and the same natural elements are carried throughout. 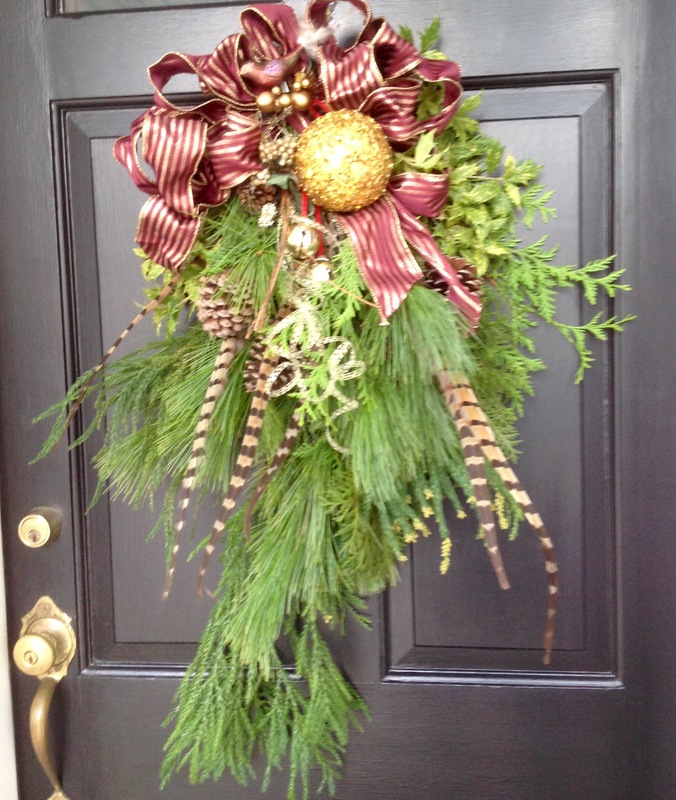 This entry was posted in Crafts, Gardening, Home Décor and tagged Christmas door swag, evergreen door swag, front door swag, Making an evergreen door swag by Johanne Lamarche. Bookmark the permalink. Everything is looking very festive Johanne! 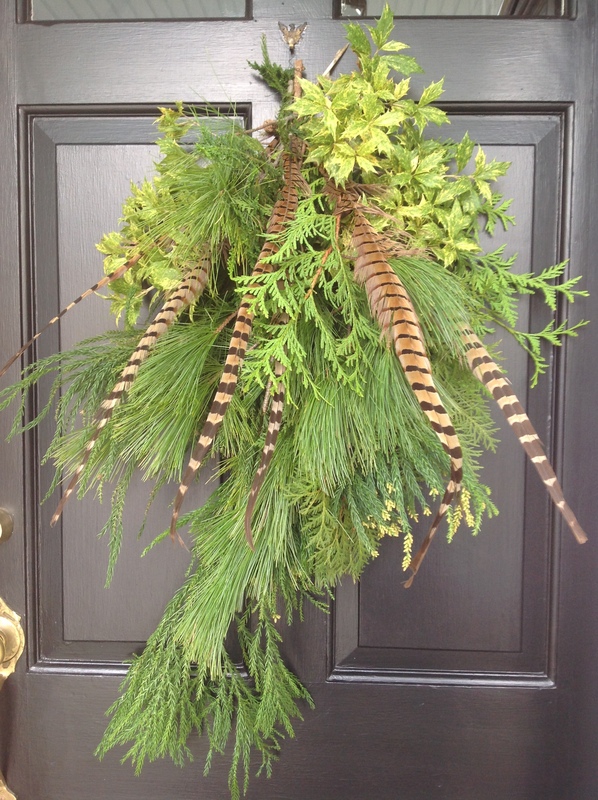 I love door swags, and the feathers are a wonderful touch! 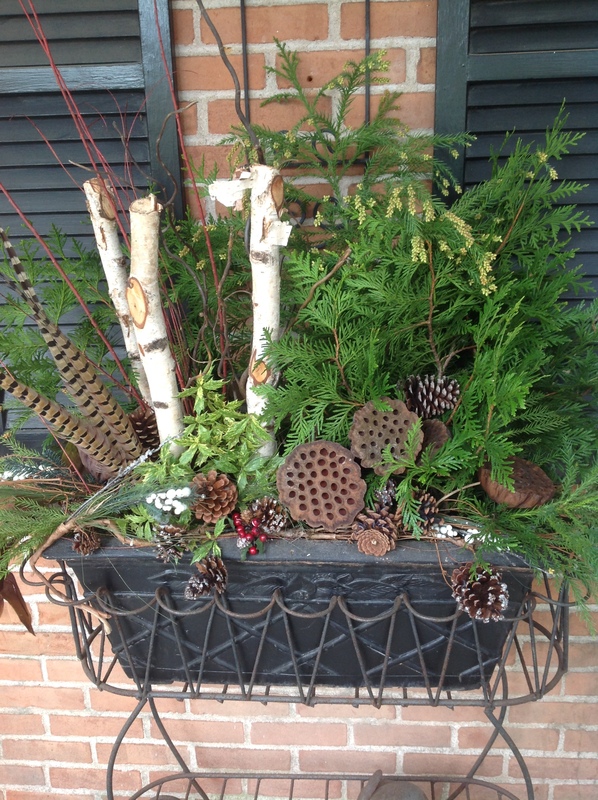 I really love the planter box with the birch logs, beautiful! Oh Jenna you have no idea what it took to pull this off. A few days from finishing up our construction we had a broken water pipe and a new flood. Back to chaos. I hope your deck project fared better! What a festive sight Johanne! Your swag graces your beautiful front door, it kind of goes together. Those pheasant feathers added a nice striking feature. We have some birch logs in the garden too and will be making a table centerpiece with candles for our garden volunteer Christmas luncheon. You’ve done a brilliant job as always utilizing what you have in the garden. Quite special! That is so very clever, Johanne, looks beautiful! So glad you like it Elaine! Happy Holiday season to you! This looks so pretty and welcoming Johanne…happy holidays! Thank you Zeba! To you as well. So very beautiful and makes me so sorry I live in an apartment. I just love those decorations Johanne especially that lantern! I bet your home is decorated just beautifully! It all ends at the front door this year Julie. We are still digging out of major renovations from an earlier flood and just a few days from being done, we had a pipe break in the brand new basement. So we have a major set back and so I am not decking out the house with this chaos! Oh geez Johanne! What a nightmare. I don’t know how you do anything dealing with that. It keeps me sane! 4 months and counting. Would be easier to build a new house!!! 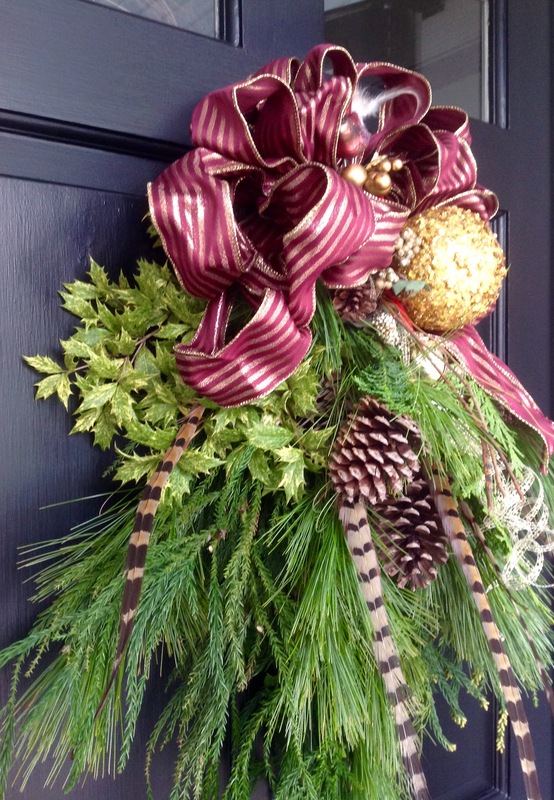 Okay Johanne I must admit it….I am lame when it comes to decorating my front door! We have beautiful lights all around and inside it subtle but fun-ly decorated but the front door…..nada! So thanks for this post and first thing in the morning, come rain or shine, I am going to somehow decorate my front door just in honor of you and this post! Thanks for the inspiration!